In the book The Accidental Creative author Todd Henry talks about the need to avoid the ping. What is the ping? 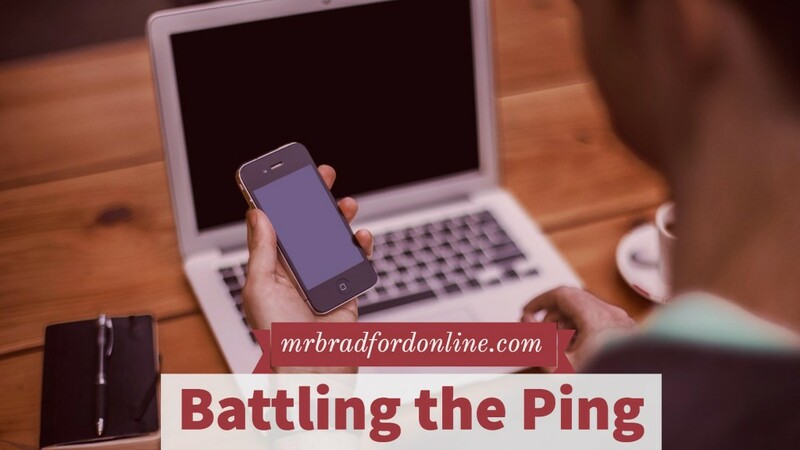 The ping is the constant desire to check your phone, to check your email, to check your Facebook account, check Twitter, check Instagram, or check any other product that is designed to be addicting and steal your attention. The ping is real. I find myself a lot of times reaching for my phone, opening an app, and then realizing what am I doing? I need to focus! Knowing this about myself this year I have tried to be intentional with how I can help battle the ping. One of the things I am doing is trying out different apps that are helping me focus a little more and avoid using my phone at inappropriate times. Below are two of my current favorite apps that are helping me focus on my work and avoid the ping. Coffitivity is an app and website that you can use to help simulate the ambient sounds of a coffee shop or cafe. The idea behind the app is that a moderate level of ambient noise has been shown to help with creative thinking (Link to Coffitivity’s research study). In my current situation I share an office with several people. The noise level can quickly get very high and I find myself getting distracted easily by several conversations in the hallway. According to research, it can take an average of 23 minutes and 15 seconds to regain your focus after you have become distracted. I’ll admit at first I was skeptical of the research and thought that the ambient noise would have no effective on my ability to focus. I was wrong. After using the app a few times I found myself getting lost in my work. I tuned out almost everything around me and focused on the task at hand. This included my phone, email, and social media. By getting into a state of flow I was no longer being drawn to ping. In fact I forgot about the ping and instead had a piece of solid work. Forest is an app and website that helps gamify focus. When you open the app you are given the option of setting the time period that you want to focus for. After selecting your time period you click on plant. This will then start a countdown clock. The game from here is simple. Leave the app before the clock hit’s zero and your plant dies. Leave the app running and when the clock hits zero your plant grows. What is really cool about the app is that every time a plant grows you receive points. After reaching 2500 points you can trade in your points and the makers of the app will plant a real tree somewhere on the planet. This is a fun twist to the game that really helps you stay focused because you know that your focus will help doing something good in the world. The app sounds silly but it works! There have been times when I feel the ping, unlock my phone, see the timer going and then lock my phone. Even though the plant is virtual I don’t want to kill it! I have found that this app is extremely helpful for when I am not feeling motivated to do anything. Times like these are when I really want to pick up my phone and goof off. Having this app has helped me refocus my attention and stay on task during these times. I’m not going to lie. I still battle the ping. Even as I type this I looked down at my phone because I got a text. The ping is here and it’s not going away anytime soon. By using both of these apps my goal is to try and fight back and regain my focus. If you would like to do the same I would highly suggest trying both apps out.